If you’ve ever been in Toronto during TIFF, you know that it can be a little hectic. Lots of celebs, bright lights, red carpets, excited fans… If you are helping out as a volunteer, covering the events as media or just experiencing the pandemonium as a spectator, it can be an exhausting 10 days. Then it’s back to real life, before you know it. And normally, in real life, the gift lounges that pop up around events like this are strictly for the celebs in the city. They get to come in, be introduced to fabulous products, get their picture taken and walk away with some amazing swag to tell their friends about. But the TIFF Essentials Lounge is different: it’s dedicated solely to media. And I have to say, as much as I love celebs, THIS IS AWESOME. 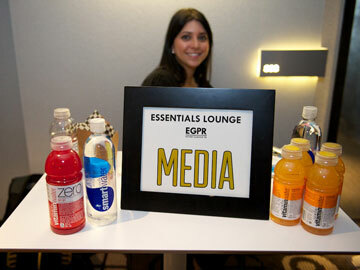 This is the third year that EGPR has put on the Essentials Lounge, with the purpose of arming the writers, editors, photographers and more with all of the “essential” products they need to survive, and then recover from, the busy lifestyle of TIFF. But really, the products that show up in this lounge are perfect for more than just TIFF; they are the must-haves for surviving any busy schedule. Whether it’s back to school, prepping for exams amidst holiday parties or interviewing for that perfect after-school job. On top of great makeup products, Benefit Cosmetics come with helpful how-to’s for getting that polished glam you need for a holiday party, or perhaps a softer, everyday makeup look for back to school or interview time, to let the real you shine through. MY FAVE: They’re Real! mascara For a dramatic look that will have people doing the double-take. These products are salon quality, without you having to spend a week’s worth of wage on them. They’re perhaps most well-known for their Frizz-Ease line that helps to tame those little (or big) stray hairs for a smoother, more celeb-like look. MY FAVE: Frizz-Ease Moisture Barrier Firm Hold Hairspray While at the lounge, I got a stylish ‘do with a bit of curl and a couple braids (still very in this season) and the look kept it’s bounce nicely with this hairspray. Who ever said fashion can’t be comfortable never wore underwear from CK. Fashion and function are both essentials when you are under pressure to look good and be at the top of your academic game. MY FAVE: Push Positive Bra Say goodbye to stiff, plastic-ky underwire and hello to support that is soft, comfortable and gives you a boost. The underwire on this bra is bend-in-half flexible, yet still provides a similar hold to a standard bra. Other brands that were showcased at the gift lounge include Elizabeth Grant Skincare, Vitamin Water, John Freida, Tan on the Run, Tealish, Winks Eyelash Boutique, Tums, Raw Juice Guru and more. I think I’m set for the week (year?! ).